What is economic development? And what does it have to do with city branding or regional branding? For economic developers, the answer might seem fairly obvious. But since place branding is a task which involves professionals from various disciplines, we thought it might be useful to introduce the concept to those not yet familiar with it. And what better way to do this than invite leading economic development professionals to share their thoughts. In the USA, I talk about the objective as better enabling residents to achieve their American Dream. But, every country has a national ethos and the dimensions of that ethos can be quantified. Moving from economic development definition to ‘action’, the next question we asked was how this goal is achieved in practice, and what this involves. How does economic development work? Practically the way to accomplish economic development objectives is through advocating/influencing strategic choices in both infrastructure and asset creation investment as well as public policies. Think of these choices as brand development, and they are articulated in a location’s strategic plan. While a place’s public and private sector leaders are responsible for developing the strategic plan, it is in the hands of the economic development professional “to ensure the process is robust and resultant action plans are both funded and executed”, as Ed Burghard puts it. In addition to facilitator, economic developers are thus also controllers. Do we need economic development organizations? One characteristic of our time is that professional organizations find themselves forced to rethink what they do and why. This affects not just economic development organizations (EDOs), but also destination marketing organizations (DMOs), for instance. With more and more business moving online, (why) is economic development as profession still relevant? If the profession doesn’t reinvent its role, I believe it will quickly become irrelevant. It requires being accountable for the role of facilitating strategic plan design and deployment. Economic Development Organizations need to provide their communities with a few important capabilities. These are not necessarily new capabilities, but the degree of mastery required to be successful may be higher than in the past. So how can economic developers make sure that there is no doubt about how useful their work is for building and maintaining competitive cities and regions? 3) for monitoring progress in achieving the strategic plan outcomes. Economic Development Professionals will have to leverage the communication skills learned by negotiating with companies in the site selection process to make certain local organizations agree and know how to support the strategic direction that are made. How does economic development link to place branding? 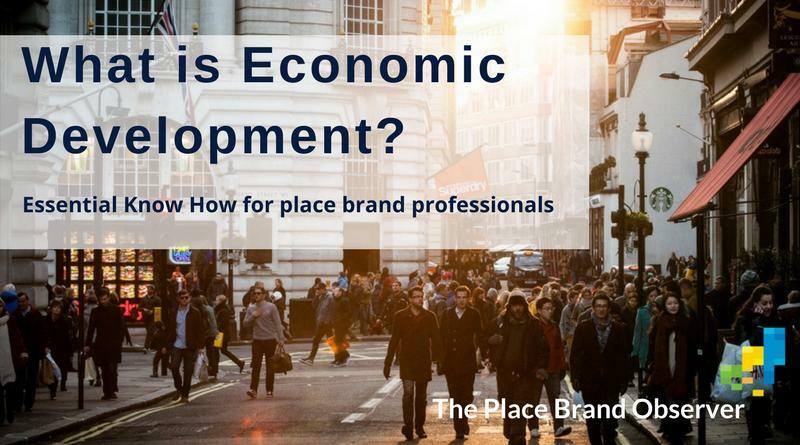 Now that the purpose and priorities of economic development are clearer, let’s wrap this up by sharing some expert views regarding the links between economic development and place branding. Again, some are fairly obvious, but others aren’t. Differences in opinion occur where a person’s understanding of ‘place branding’ differs. In fact, every professional discipline understands it differently. Place management and place branding are an essential part of creating places where people want to invest, work and live, but you have to ensure a quality product to begin with. Place is very important, but so is capacity, in regard to talent, infrastructure, entrepreneurial capacity, and many other aspects. Economic developers play a key role in identifying and filling those gaps. When we look at most places in the United States, we have them at the top of mind because they either have an incredible landmark or economic vitality. When I say Yosemite, Grand Canyon, The Redwoods you know them by their environmental aspect. If I say New York City, Dallas, Las Vegas, you know them because of the strength of their economy. Those cities are known because of the jobs and wealth being created there. The economic vitality of a city then creates a capacity in the system for great civic programs to move in, to bring in amazing people, for great churches and organizations to thrive; but before any of that can fall into place you must start with good jobs. Without great jobs and a strong economy we simply cannot create place branding, we do not have the capacity or the resources. Economic development is the foundational element of place branding. The International Economic Development Council (IEDC) is an excellent source for latest economic development news and thinking. We recently signed a strategic partnership agreement with the IEDC, through which we will be able to dig deeper into the world of economic development, and its links to place branding practice. Enjoyed this brief introduction to the world of economic development? Share and spread the word!